As part of his final thesis at the Bezalel Academy of Arts and Design in Israel, student Ori Elisar has been experimenting with a new way to display typography. Elisar created an "ink" out of paenibacillus vortex bacteria, and he uses it to write out various Hebrew letters. "Using my research, experiments and results, I am hoping to question nature, culture, character and language with some new theories of my own," the designer told Dezeen. The original idea formed two years ago, and with the help of Professor Eshel Ben-Jacob at Tel Aviv University, he spent three months developing the initial concept of biological ink that develops over time. It took another two months to grow the actual letters. Elisar wanted to mirror the evolution of the Hebrew alphabet with the biological evolution of life on Earth. 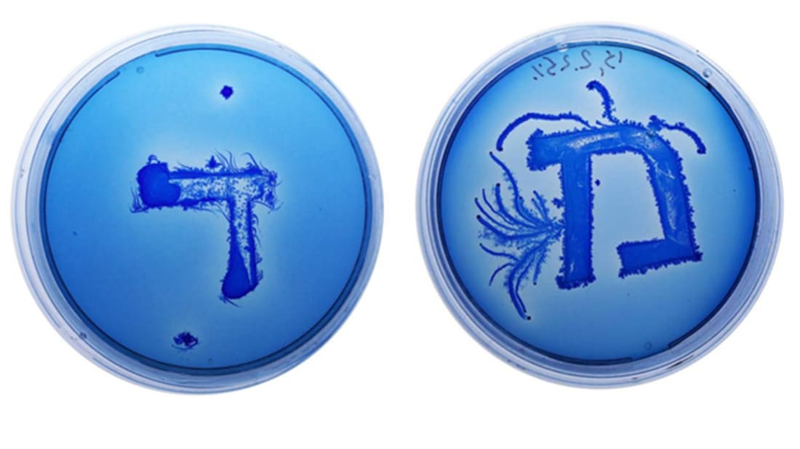 To do this, he put bacteria in the shapes of ancient letters in petri dishes. Next, he added algal protein food in the shapes of modern letters. Slowly, the bacteria ate the food and formed the shape of the new letter. The transformation of the language becomes literal when it can actually be witnessed in the petri dishes. "Biodesign specifically allows us designers to answer visual and conceptual questions, and helps us solve design briefs using tools from the world of nature which, based on aesthetics, are hard for us to recreate," Elisar said. Elisar wanted to prove that typography doesn't have to be flat or static. His living letters are intended to help reinvent the field.